This past Saturday my wife encouraged me to take a day away from SCUBA diving to watch the Naha Haari, Dragon Boat races, at Tomori Port in Naha. While even though the sky was cobalt blue and the water as flat as a pool table I was NOT disappointed missing a day of diving! In fact watching the teamwork and determination of the Naha Haari motivated me to consider doing this myself, but that is another story. We arrived at Tomori Port early on Saturday morning in order to secure parking near the port. Our early arrival gave us time to watch the festivities unfold. Right at 10:30 sharp the Dragon Boats, filled with colorful teams, pulled away from the wharf signaling the start of day of racing. Saturday was the last day of a three days of racing that makes up the Naha Haari event. This day the corporate and military teams are showcased. Each team races for time and the pride of winning their heat. The heats were run every 15 minutes, or so, and racing continued throughout the beautiful Okinawan Saturday. The military sponsored women's teams arrived early and began gathering just after 11 a.m. Their race was scheduled for 12:15. Teams from the Air Force, the Marines, and the Navy began talking strategy while anxiously awaiting their turns in the boats. The boats, all three of them, were works of cultural art. We found that the black boat running closest to the wharf quay wall was turning the fastest times. When the ladies entered their boats at 12:30 the Marines were on the outside with the Air Force in the middle and the Navy women were closest to the wharf in the black boat. When the gun sounded the start the Navy women immediately unfurled a black Jolly Roger matching their boat and black headbands. 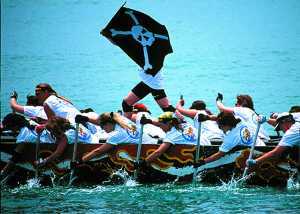 As they dug their paddles deep into the water their 40 foot Dragon Boat seemed to lurch up and forward in the water creating a white foamy bow wave. Team members, before the race, told me that their Navy Women began meeting in early March at Kadena Marina. Getting there as early as 5 a.m. to practice paddling techniques they began to form a team spirit early in the morning. Now I now how cold the water is in March and I cannot think of a more motivational way to form team spirit than to paddle in cold water at 5 a.m.! And we think the Marines are crazy? But on this warm Saturday afternoon it appeared to me that the cold morning workouts were paying off for the Navy Women. They pulled away handily from the rest of the field and in the homestretch they enjoyed a commanding lead over the Air Force and Marine Women. What was most apparent was the determination on the faces of the racers. Each team really put their heart and souls into the race. While the Navy won the heat the Air Force and Marine Teams fought a really hard battle amongst themselves in the outside lanes. The Air Force pushed ahead at the turn but the Marine Team put on a strong sprint on the return leg, and into the wind, made it quite a race between the two boats. ”It was over too fast,” said one of the Navy racers. She was reflecting on all their hard work and preparation but she seemed quite happy that the Navy Ladies had won their heat and were setting in third place overall for time. That was quite an accomplishment for a team that had started out on those cold March mornings determined to do well. They did well and winning their heat seemed to be the prize they came for. However, it seemed to those of us watching everyone that competed came away a winner as well. The culture of Naha Haari is not to win but to enjoy the competition. With that as a goal, everyone was a winner.